The customers of Ponteland village Post Office have given a huge vote of confidence in the services provided by the staff. 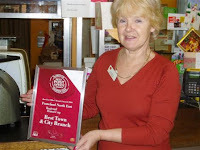 The vote was organized by the Post Office and the Ponteland Office was the runner-up for the Northern region. This is a feather in the cap of long-standing Post Mistress Lola Bennett who has been in the job for twenty years. Praise to the staff on the counter, Norma and Lindsay, and the staff in the shop Jean and Kath and Lola gives a big thank you to her customers for their support.